The Global Ignatian Advocacy Network (GIAN)-Ecology continues to pursue the call to dialogue on sustainability science and values that emerged from previous discussions in Stockholm, Sweden in 2013 and in Bukidnon, Philippines last year. The release of the papal environment encyclical,Laudato si’, has made this call for dialogue more urgent. Discussions for action on global challenges today need to begin with and integrate an understanding of the reality of a world at risk. Science already shows us the planetary boundaries of our natural and physical world and where we exceed the thresholds, even if there is still much to be better measured. These boundaries are experienced in the landscapes where we live, in cities or rural communities, in temperate or tropical areas. Local concerns that may not be the most critical globally are obviously connected to the broader pattern of events. It is this growing awareness of global with local and local with global that must motivate local actions relating to the sustainability of people and their landscape. Science alone will not provide solutions for a more sustainable world. Given the magnitude of the concerns as we reach and pass these boundaries, there is a desire to communicate to the world and seek a response that shifts minds and hearts, building solidarity and sustainability. 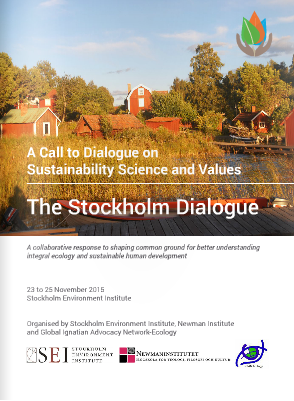 It is in this context that the Stockholm Environment Institute, Newman Institute, and GIAN-Ecology are coming together and shaping a common ground to understand better the need to integrate sustainability science and values. The effort is to promote greater engagement and understanding among those doing environmental science and those working with local communities for sustained initiatives on resource management, transformative education, and simple lifestyle.